Happy New Year, sweet friends. 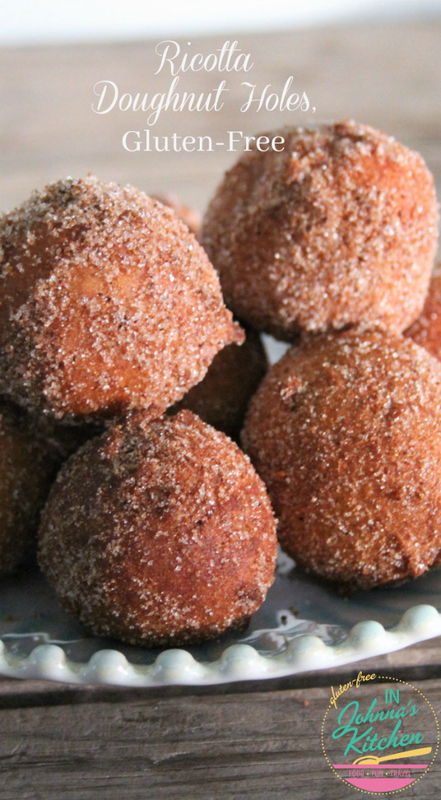 How about making Ricotta Donut Holes, gluten-free, to kick the year off? 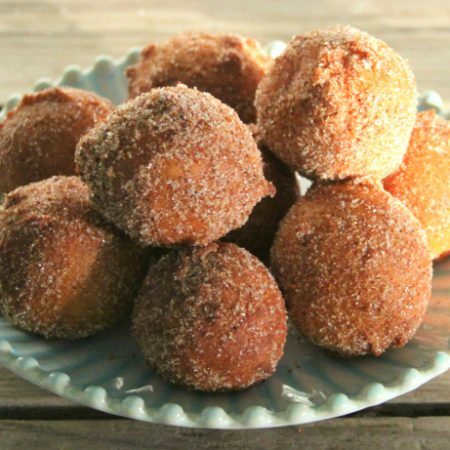 Or are they Ricotta Doughnut Holes? Is it donut or doughnut? Either way, these are the perfect sweet bite to start 2017 off right! Our New Year’s Day tradition is to have brunch with dear friends at Port Fonda. It’s one of my very favorite restaurants in KC and I am able to eat many things here that are gluten-free. Except these. 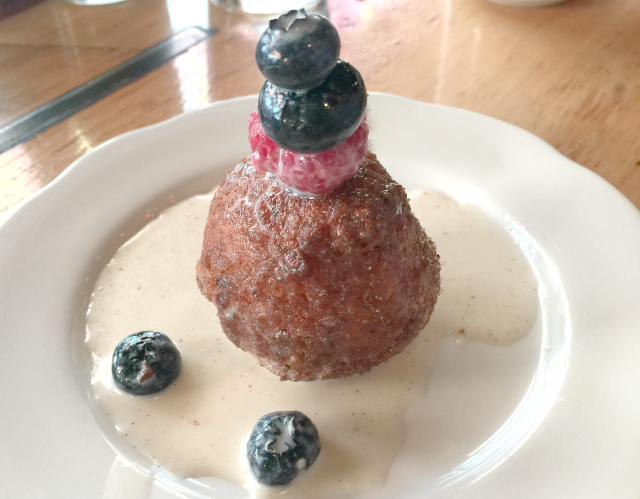 Port Fonda has beautiful ricotta doughnut holes, four to an order, rolled in cinnamon-sugar, aswim in mezcal tres leches and topped with fresh berries. So full of gluten. So off limits for me. My favorite fella and our friends split an order, four enormous doughtnut/donut holes that are each larger than a golf ball but smaller than a baseball. One is really enough, so they claim. I’m not buying it. I would want the order to myself if could I eat them. 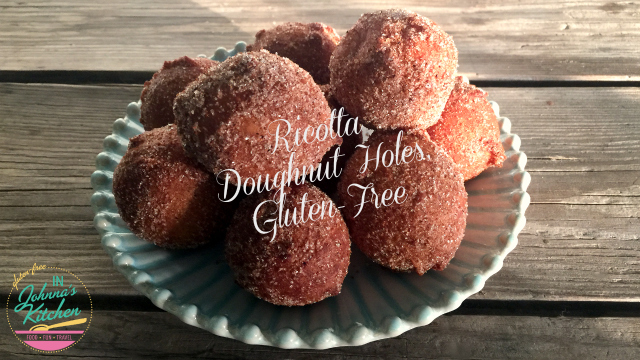 This year I came home and decided to whip up a batch of my own ricotta doughnut holes, without the gluten. The first one, hot out of the fryer, rolled in cinnamon and sugar, had me convinced I had struck gold. I finished frying the entire batch, only a dozen or so and then set about making a second batch. A batch for the neighbors, of course. And then another batch because plates were returned empty, asking if I might perhaps be making more? New Year’s Day turned into a lovely afternoon of recipe testing one of my favorite foods ever, doughnuts. Or donuts. However you want to spell it, these are lovely fried balls of dough, perfectly sweet, delightlfully soft and airy on the inside, slightly crispy on the outside. You’ll need just a few things to make these. First, you’ll need a way to fry them. You could fry in a deep skillet. I use this tiny little fryer. It’s nice because it keeps the temperature consistent and has the cutest little removable fry basket. 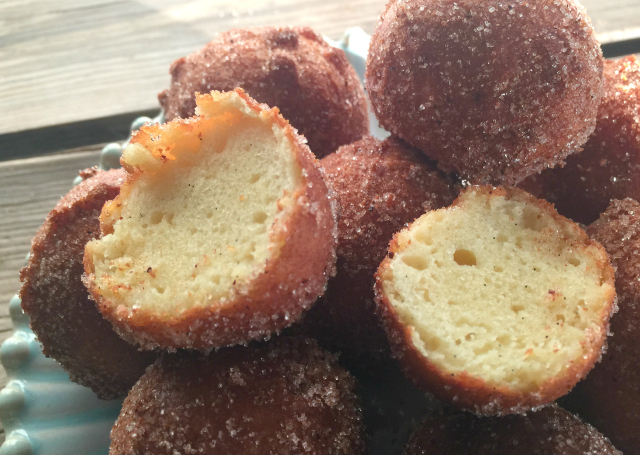 It holds three of the ricotta doughnut holes at a time. Then you’ll need a scoop for the dough. I used this one. (You could probably use a big spoon, too. I like the ease of a scoop.) It’s a #40 portioner, so about 1.5 Tablespoons. You’ll also want to whip up a batch of my Favorite Gluten-Free Flour Blend made from four ingredients that are available at most grocery stores. My blend has no gums in it. I don’t find gums necessary in many recipes. This one works very well without xanthan or guar gum. The absence of gum also helps to achieve this beautiful texture inside. Pretty, right? Alright, that’s everything you need to know. Except for the recipe. Here ya go. Enjoy! In a large mixing bowl, whisk together flour, baking powder and salt. Set aside. In a smaller mixing bowl, mix together ricotta cheese, eggs, sugar and vanilla bean paste. Mix by hand until well combined. Gently stir wet ingredients into the flour blend. No need to overmix, just stir to combine. Once combined, allow to rest for 15 minutes. While dough is resting, heat oil in fryer until it reaches 375 degrees. Line a plate with paper towels. In a small bowl, combine 1/4 cup of white granulated sugar and 1 Tablespoon of cinnamon for the cinnamon sugar topping. Once oil has reached 375 degrees, use a #40 portioner to scoop out 1.5 Tablespoons of dough at a time. Alternatively, you could scoop about a generous 1.5 Tablespoons of dough with a spoon. Gently drop into the oil and fry for 5 to 6 minutes. Give the doughnut holes a flip (or a slight jiggle if they are in a removable fryer basket) to roll them over midway through frying. They will be evenly browned on both sides when ready to be removed. Remove from fryer and place on the paper towel-lined plate. Add more scoops of dough to the fryer. 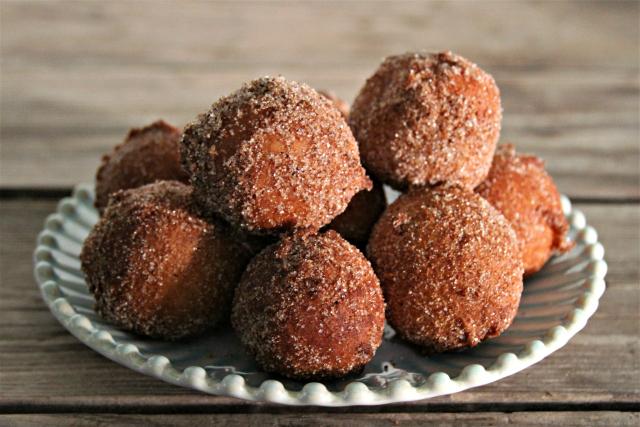 While the next doughnuts are frying, roll the first few in the cinnamon sugar mixture and place on your serving plate. Makes approximately 12-14 doughnut holes in the size shown (a generous size). « Christmas Lights Drive Kansas City: Over Half a Million Lights! I can’t wait for you to try these! !